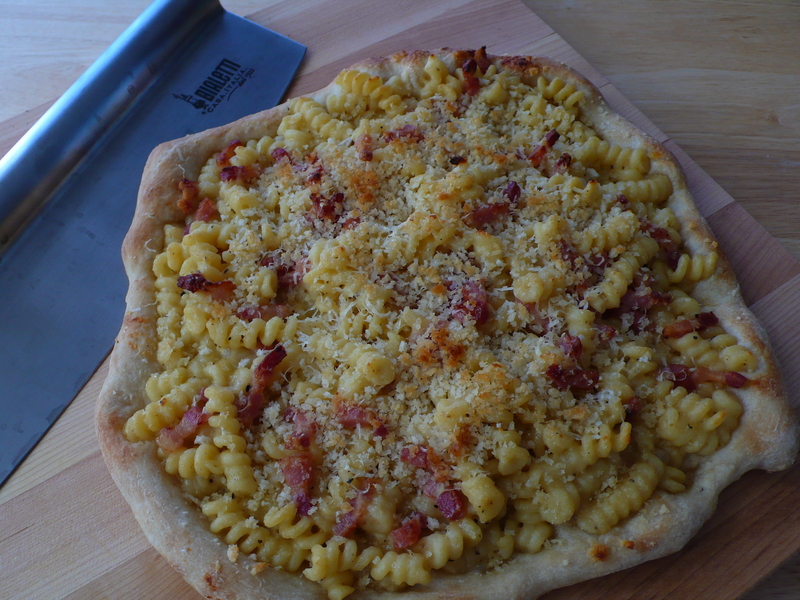 Adapted from Ina Garten, and used (without tomatoes or baking) to top my Mac & Cheese Pizza. Meanwhile, heat the milk in a 1 quart/4 cup measuring cup in the microwave (to save yourself a pot) but don’t boil it. Melt 6 tablespoons of butter in a large (4-quart) pot and add the flour. Cook over low heat for 2 minutes, stirring with a whisk. While whisking, add the hot milk and cook for a minute or two more, until thickened and smooth. Off the heat, add the Gruyere, Cheddar, salt, pepper, and nutmeg. Add the cooked macaroni, pancetta and stir well. Pour into a 9×13 inch baking dish. If using as a pizza topping, no need to bake it here. Top pizza crust and proceed as usual.